Far more people in America were killed by firearms from 2001 to 2013 than by terrorists during the same period, according to a report from the Centers of Disease Control and Prevention. A total of 406,496 Americans were killed with firearms, compared to 3,380 U.S. citizens killed by terrorists. 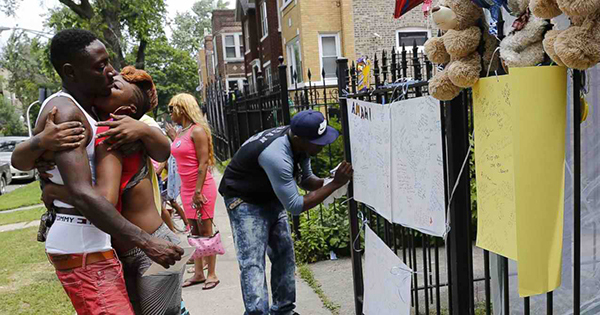 Chicago is now the worst American city in gun homicides. In 2015, Chicago had 470 homicides and 2,939 shooting victims, making this city the worst of all U.S. cities. So, is gun control the answer? According to an article written by Jesse Jackson, printed recently in the Milwaukee Courier, it will take more than gun control to reduce gun-related deaths. Jackson points to the need to address poverty in America. As Jackson explains, almost twice as many African American children live in poverty than white children. Also, it is African-Americans and Hispanics who suffer the highest rates of poverty in America and "are the most isolated into separate and unequal neighborhoods." With poverty comes dysfunction, including alcoholism, drug use, and violence. Yet, as Jackson states, "Yet no national reforms have been passed or even gotten much consideration." But gun manufacturing is increasing! Meantime, the manufacture of guns in the U.S. has doubled "since the beginning of the Obama Administration." There are now high power weapons that are being sold in the U.S. that are capable of powerful destruction. Regarding the two issues of gun control and poverty, Jackson explains, "these are two fundamental challenges that ought to be at the center of our debate."